This weekend, I was playing with ring tones, and so I called my iPhone several times to test them out. 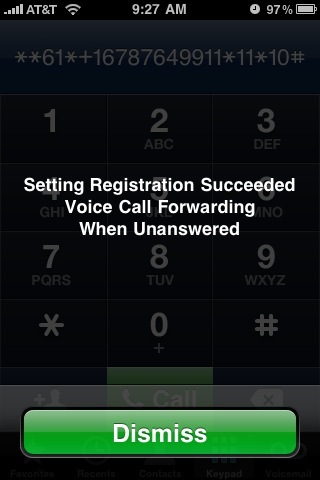 I started wondering how long it took before my unanswered calls were redirected to voice mail. So I timed it. By default, it appears that AT&T sets that delay to 25 seconds. When I worked at Ericsson (1998-2003), I collected a bag of tricks that I used to customize certain features of my phone and my Cingular account. It turns out that some of these tricks still work today. One of those tricks was to set that voice mail delay to a longer value by using the GSM “star” codes. The wise folks that created the GSM cellular standard understood that some people might have an older phone, but that they might want to use newer network features. For example, remember the “bag phone” that people used in the early 1990’s? Or the Motorola “brick”? Those had simple calculator-style displays. The did not have a “voice mail” menu… all they could display was numbers! However, the guy at the phone store could program a brick phone to forward unanswered calls to voice mail after a certain delay. Or he could turn on call forwarding. In fact, he is actually telling the BASE STATION to forward unanswered calls, since that’s the piece of equipment that handles that job. After all, the phone itself might be turned off, or have a dead battery, or it might be in Africa somewhere. It turns out that most features of the GSM network can be accessed using a series of digits dialed into the keypad. The sequence for call forward on no answer is **61*(target number)*11*(seconds)#. If you typed that sequence into the old Motorola “brick”, a message would be sent to the base station to say “forward my phone calls to the following number if I do not answer within a certain number of seconds”. That same star code works on a modern phone as well. This is also how “smart” phones work — the user interface runs on a PDA-like device, and star codes are sent over a serial line to the “GSM modem module”, a completely separate phone-on-a-chip that does nothing but handle the phone calls. Here’s what it looked like when I customized my voice mail delay from my iPhone. 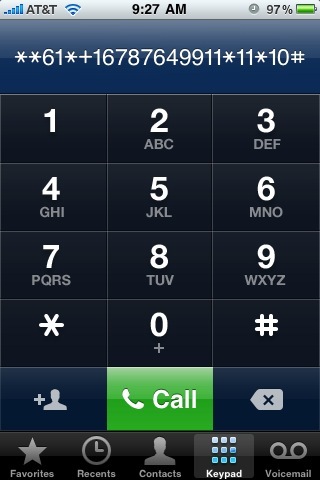 First, I dialed the star code to see what my current voice mail setting was. That code is *#61#. I wrote down the voice mail number — this is the number for AT&T’s voice mail system. 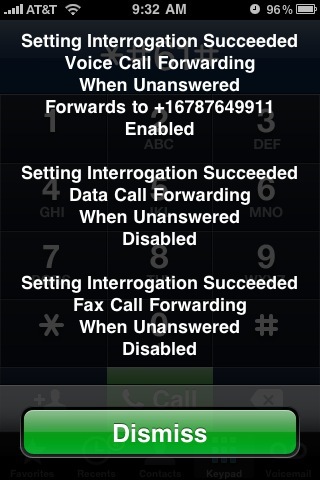 Then I dialed **61*+1xxxyyyzzzz*11*10# to see if it would change my “call forward on no answer” delay to 10 seconds. And I got this confirmation screen. Then I called my iPhone. Sure enough, after 10 seconds, my call was routed to voice mail. Of course, 10 seconds is too short — I used that number as a test. So I repeated the process to set the delay to a more reasonable 30 seconds. This is not hacking. This is a documented feature of GSM cellular networks, and it is exactly what happens behind the scenes when you enter a phone number in the “voice mail” menu of a cellular phone. The only difference is that the menu uses a hard-coded delay value, whereas you can set your own delay if you enter the command manually. This process should work on any GSM phone, not just on the iPhone.